SWELL is a surfing inspired clothing brand that sells men's, women's and children's casual apparel, accessories and surfing gear, from its facility in Irvine, California, United States. The company is online only at Swell.com and is owned by the publicly traded clothing company Billabong International Limited. Despite this SWELL still sells many other popular surfing and skateboarding brands alongside Billabong. Swell.com was founded in 1999 and was only later purchased by Billabong. Today founders Jeffrey A. Berg and Nicholas A. Nathanson still hold executive positions, while John P. Broderick serves as President. Data suggests they make upwards of $2.5 million in yearly revenue. The Swell.com catalog is organized in to the following main categories of clothing: Men, Women, Children, Shoes, Surfing Gear, Skateboarding Gear, Accessories, and Sale Items. You can browse these categories and refine the listings by size, color, style, price range and other parameters, or if you have something specific in mind you can also use the search bar. Types of clothing available include Regular Shorts & Boardshorts, Pants & Jeans, T-Shirts. Tank Tops & Vests, Shirts & Polos, Tops, Jackets, Dresses & Skirts, Rompers & Jumpsuits, Kimonos, Underwear, Socks, Swimwear, and much more. Shoe styles include Sandals, Boots, Slippers, Casual Shoes, Hi-Tops, Uggs, and others. You can also buy accessories like Belts Hats, Wallets, Jewelry & Watches, Beach Supplies, Scarves, Gloves, DVDs, Phone Cases, and much more. For the active surfer you can buy Wetsuits, Rashguards, Surfboards & Bodyboards, Board Bags, Fins, Leashes, Traction, Tools, Wax, Safety Equipment, and other gear. Skateboarders can by full setups, or individual Decks, Trucks, Wheels, Bearings, Grip Tape, and Tools. You can also choose from a wide variety of Skate Shoes, and popular skate brand Clothing. 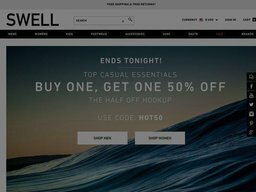 Popular brands stocked by Swell.com include Billabong, Element, Volcom, O'Neill, Free People, Ripcurl, RVCA, Quicksilver, Maaji, Vans, Braven, Chaser, Banks, Electric, Globe, and hundreds of others. Know somebody who is a surfer or skater but aren't sure what to buy them? Why not get them an e-gift card (available in values between $15 and $500) so they can make their own purchasing choices? Swell.com supports most common credit cards for payment, such as Visa, Discover, American Express, and Mastercard, as well as Paypal and Bank Transfer. Swell.com ships orders within the United States and overseas, using a variety of options. To update these for your destination country you can click the flag icon at the top of the page. This will also display products with your local currency so you know exactly how much you are spending. Within the US shipping is primarily handled by FedEx, starting with Standard. This costs a flat rate $4.99 and is completely free on orders valued over $39. Delivery time is 3 to 6 business days. Two Day Express is $9.99 for orders over $39 and $14.99 for orders below. Next Day is $19.99 and $24.99 respectively. International shipping is handled by DHL. Delivery to Canada is $12.99. Australia, New Zealand and Europe is $19.99, and the rest of the world is charged $24.99. For a full breakdown visit the shipping page of the website or add items to your basket and enter a delivery address. Returns can be made within 60 days of the original purchase date for a full refund, and up to 180 days for store credit. If your order was valued over $99 you qualify for for a free return label, otherwise the cost of this will be deducted from your refund or credit. All returned items must be in their original and unworn condition, unless you are making a claim on a damaged or defective item.